Know More about Our Wigs Before Your Purchase, Enjoy Better Shopping Experience. *All products are returnable and you can enjoy 30 days free return or replacement against from man damage. All products are brand-new from us, please contact us immediately if you have any doubt on the condition of items you received. *We choose high quality heat resistant synthetic fiber, natural and soft touch, bring you more confidence and charm. *Different wigs for your need, perfect for daily use, costume party, cosplay, concerts, theme party, dating or just for fun. Using a soft tape measures, wrap it all around your head, keeping it at your hairline from ear to ear. At the front of your head, position in the center of your forehead. 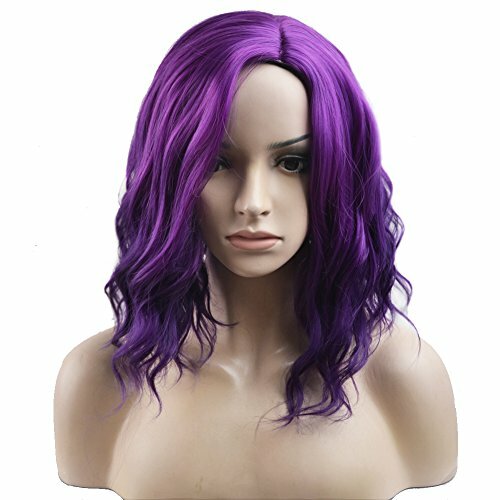 Cap Size: This wig has soft, adjustable straps to fit most size/shape heads, average fit 21.25 - 22.25 inches head circumference, we suggest you measure your head circumference before your purchase. Specification: Length from crown to ends-Approx 13.8 Inches (+/- 1.2 Inches), Weight- Approx 220g (+/- 30g), Color-Mix Purple. About The Hair Style: All wigs are trimmed by hand, so the hairstyle may go slightly difference from different batch, you can styling this wig base on your need. Importance Notice 1:Heat resistant temperature for this wig is: 150℃ / 302℉(Maximum). Please kept it away from fire, do not iron or dye this wig if you are not professional. A little smell for the fiber is normal, you can wash it before the first wear. Importance Notice 2: The color of wig may vary due to manufacturing variations or your phone/computer monitor's color settings. The wig you received may have slightly color difference to the item pictured in this listing. If you have any questions about this product by BERON, contact us by completing and submitting the form below. If you are looking for a specif part number, please include it with your message.